Synephrine is an alkaloid, which is about 6% of the extract of bitter orange fruit. Synephrine is a substance obtained from the fruit of bitter orange, with properties dangerously close to ephedrine and amphetamine.It belongs to the so-calledthermogenics, accelerating fat burning.The use of synephrine supplements may have side effects that pose a health risk. The variety of use of bitter orange fruit can surprise you.Although freshly picked from the tree are not suitable for eating (due to the bitter taste), the products from them will make a sensation in the food industry.Starting from marmalades and preserves, to spirits – the famous blue Curaçao liquor is made of bitter orange fruit.In addition, fried fruit in the sugar are used to decorate cakes, and the orange oil obtained from it is used as an essence for cakes and sweet dishes.Dried bitter orange peel is used in traditional Chinese medicine to stimulate appetite and to treat indigestion.In this context, it seems almost paradoxical that it is also used in dietary supplements supporting slimming.And this happens thanks to synephrine – an alkaloid, which is about 6% of the bitter orange fruit extract. The impoverishment of almost every person who decides to lose weight is excess body fat.It usually locates on the stomach, hips and buttocks in the form of rollers, which are the aesthetic nightmare of every woman.Fighting unwanted fat tissue is not easy and requires a lot of physical effort and liters of poured sweat.It is an intense workout that speeds up metabolism, increases body temperature and burns fats that are a source of energy for the body in such situations.What if we do not like to sweat or just do not have time to go to the gym? In such situations, you can reach for the so-calledthermogenic.This name is used to describe natural substances that cause the release of heat from the body by increasing metabolism, increasing energy expenditure and accelerating fat burning.They constitute a separate segment of dietary supplements supporting slimming.They are very popular especially among those who practice bodybuilding, because by minimizing the thickness of body fat, they help to better visualize the muscles. Unfortunately, very often as thermogenic substances, there are also prohibited substances or dangerous substances, which at the same time are considered the most effective.I am talking here about dinitrophenol (DNP), the use of which has already led to the death of several people in Poland.A strong thermogenic is also ephedrine (a precursor of amphetamine), which a dozen years ago was a common addition to slimming dietary supplements.Unfortunately, during a long period of taking such preparations, a number of side effects occurred, and even fatal cases.For this reason, the Food and Drug Administration in the US issued a ban on the use of ephedrine in slimming preparations on April 12, 2004.In Poland, ephedrine is prescribed by a doctor and used mainly in nasal decongestants. Read also: Best fat burners – Clients’ ranking 2018! 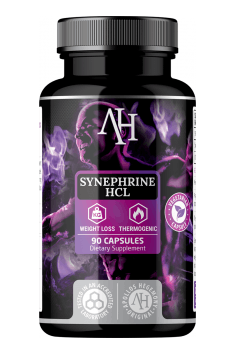 Synephrine – a safer substitute for ephedrine? Over the years, a substance was sought that could replace ephedrine in slimming preparations.One that would be close to its effectiveness and at the same time be safer for the health and life of those using it.In this way, synephrine was found, the chemical structure of which is very similar to ephedrine.Similar is also with its operation.Synephrine stimulates the nervous system in a similar way as adrenaline, tyramine or ephedrine.It affects the beta-3 receptor, which causes lipolysis (fat breakdown) with the simultaneous start of thermogenesis.Synephrine also raises blood pressure, accelerates blood circulation and increases the minute volume of the heart.At the same time, it dilates the bronchi, interrupts the asthma attack and clears the sinuses like ephedrine. With the appearance of preparations with synephrine, there have also been reports indicating that, like ephedrine, they may pose a health risk.Also in the literature there are a number of reports on the negative effects of consumption of ephedrine-free slimming formulations, but containing synephrine.In one study, the researchers showed that consuming 900 mg of a standardized extract of 6% synephrine in the form of a dietary supplement can cause an increase in blood pressure and heart rate just a few hours after a single dose of 1. A case of a 55-year-old woman is also known. which had a myocardial infarction and which during the year preceding the event was taking a slimming preparation containing 300 mg of bitter orange 2.